Ha, Marches review is not late. I only recently received the box. I think my favourite thing this month is that they changed their packaging. The bubble mailers are not recyclable (or at least they are not where I live) but the cardboard is. I am not actually going to be putting it in the recycling but plan to hold onto it for a gift box. It is adorable! 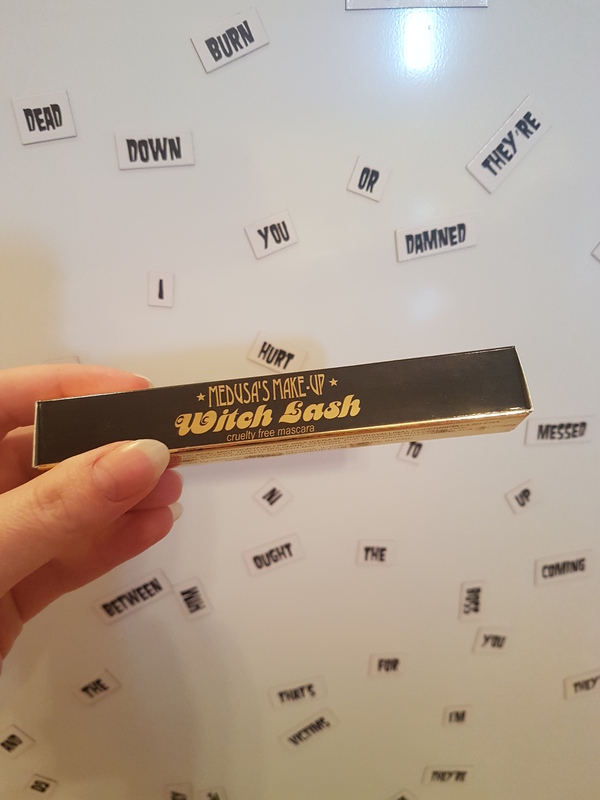 Here we have Witch Lash in Electric Blue. Not quite sure if I will be wearing this one or not. So because of that I have decided not to even open it. I may actually include it as a gift to my one niece. I am pushing for this girl to have fun with her make-up while she is still young. I mean my favourite eye look at in grade nine was yellow liner on top of yellow eye shadow. I sported very bright colours and still like them. I just tone it down a little for my job. This is $12.00 USD. 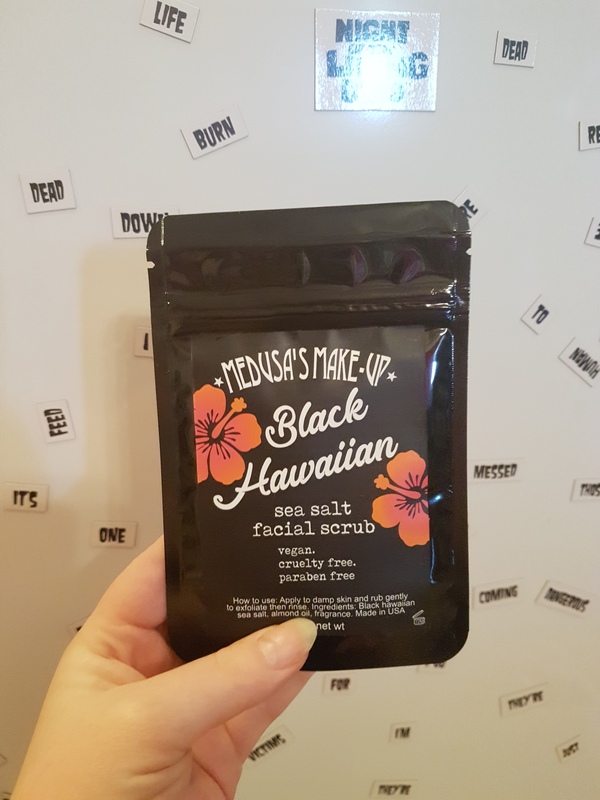 Black Hawaiian Sea Salt Facial Scrub. This one is $10.00 USD. On the fence if I am going to try this or not. I really just do not use face scrubs. 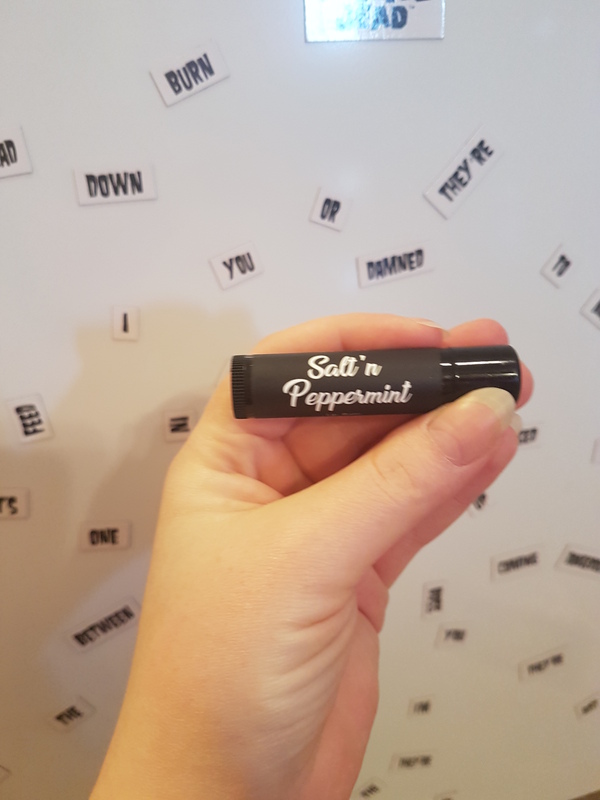 Salt N’ Peppermint lip balm is $8.95 USD. I do enjoy the formula but I am not going to lie; this is just to expensive for my taste. It is a lip balm and I would not pay that price if it was in CAD. I do have others I enjoy just as much. 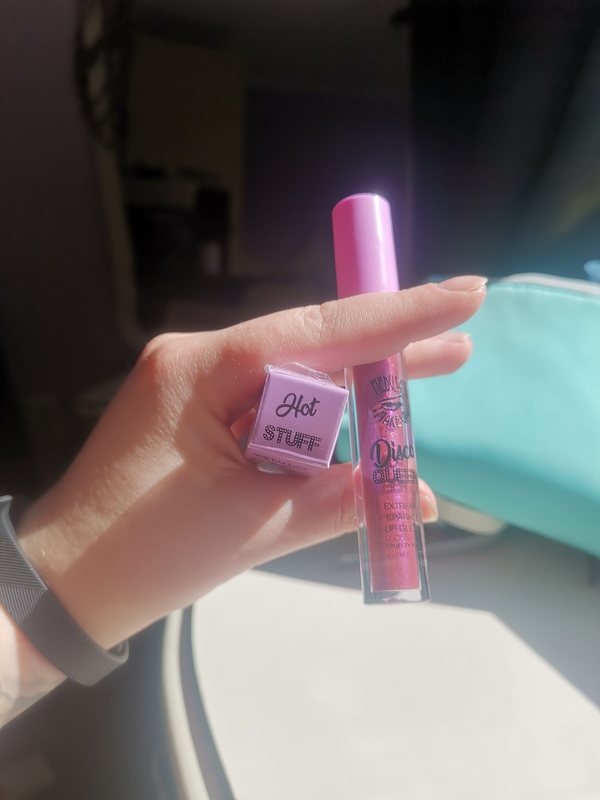 **Very much like this lip chap but the cost still hurts me. 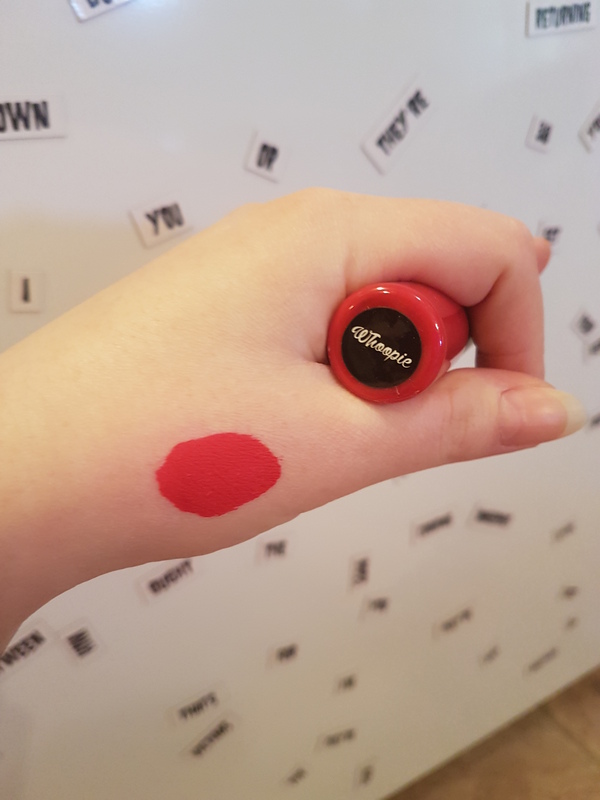 Here we have Lip Paint in Whoopie which is $12.00USD. 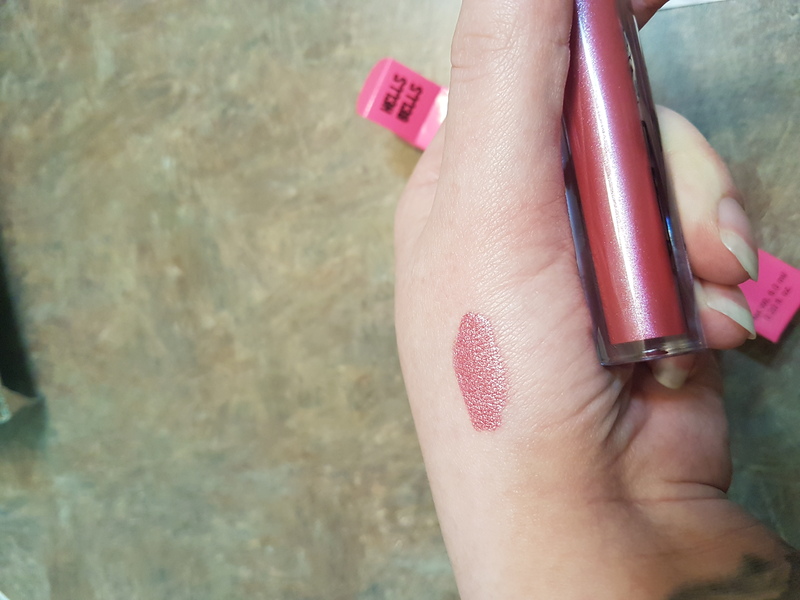 This is a true red and this was actually my second swatch. The first was a pain to get off and had not smudge in 24 hours even with constant hand washing. This one I took off not long after it dried down (dries down to a matte finish). My hand was raw for the rest of the evening. I have just checked online for the product and see they have a lip paint remover. I am going to be honest and wished they would have included it in the box. I would still have this opinion if I was head over heels for everything else. It is going to be quite a while before I actually try putting this on my lips. Not until I find something that will remove it fairly easily. I mean in my house and not special ordering. So, not on them but I am going to cancel my subscription for the time being. I may be giving a way half of the box and for the cost it is just not worth it to me. I do enjoy it enough that it is just going to be a break. I will re-subscribe in the future. 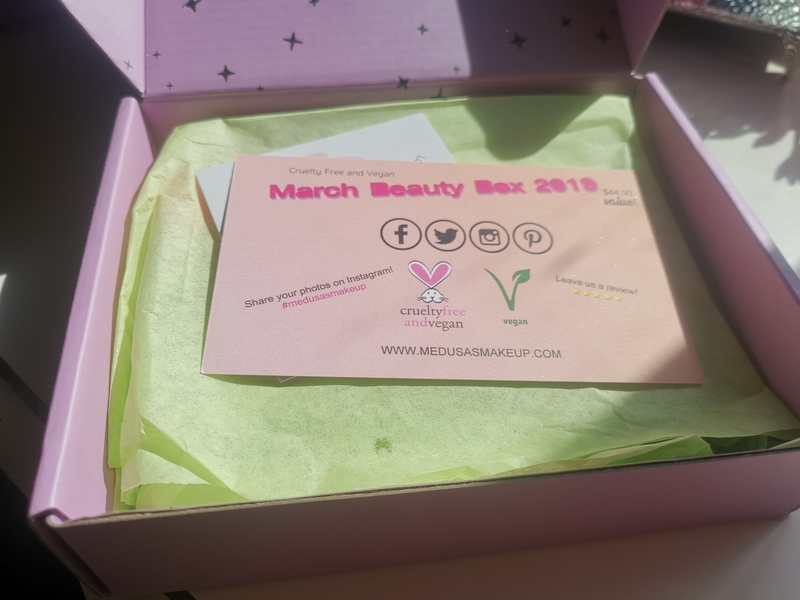 This is very much a late review of the subscription but they have not sent out Marches yet. So, better late than never. I was quite excited again when I seen the products for this month. This first one I used immediately. I have not used a toner in quite a long time. I am getting older and should be putting this back in my routine. It does have quite a strong rose smell but wears off quite quickly. The mist is fine enough that I do not end up with extremely wet drops in some areas. I added this to my evening skin care routine. I have not yet seen a difference mostly because I am not quite in the habit of using it yet. So to start excuse the very dirty hair (wash day is on the way) and it’s late. My skin is gross and I am clearly not wearing any other make up. 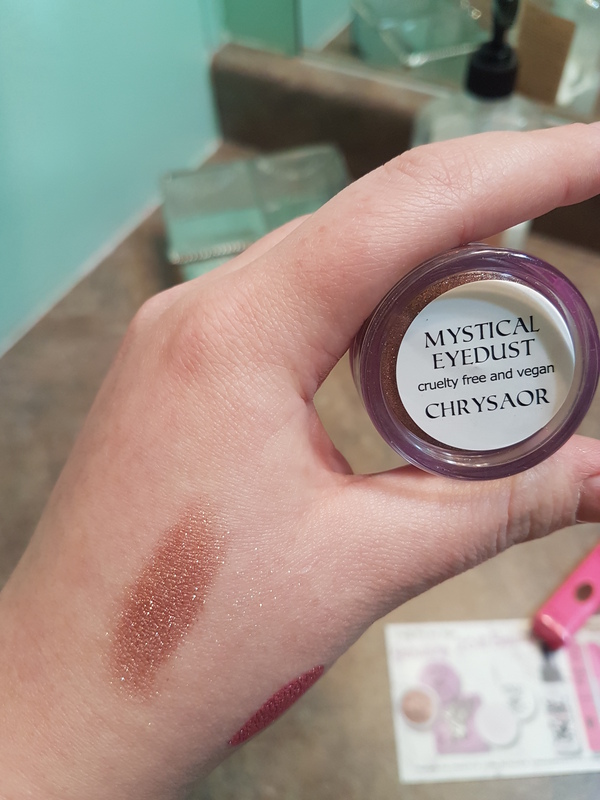 When I first opened the tube and initially swatched it, I was concerned it would be very dark. This is why I also applied it. It is not as dark as I thought it would be. The longer I wore it and taking a second look at the picture I really do not mind it. I am going to start drowning in neutrals here soon. This brown in nothing like I have though. 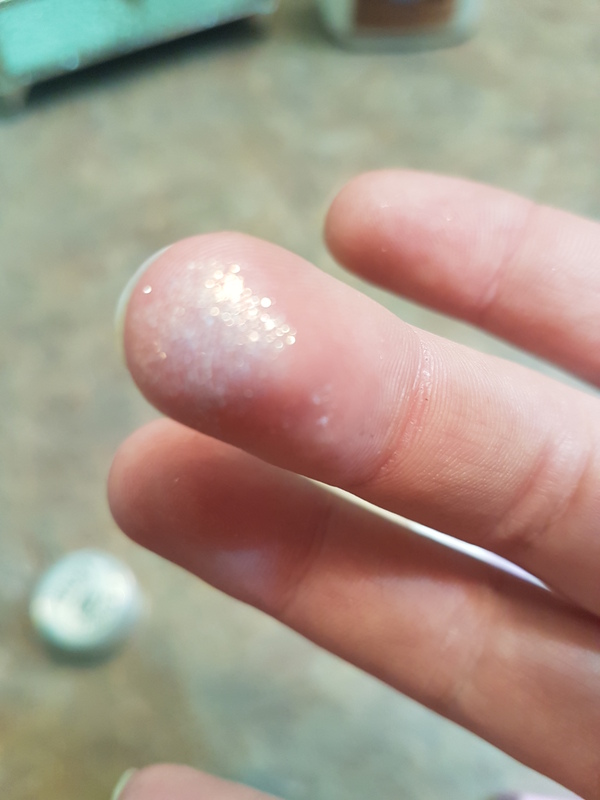 There is a fine glitter in the pigment. It has a purple/blue shine to it. Which you cannot make out in the photo. 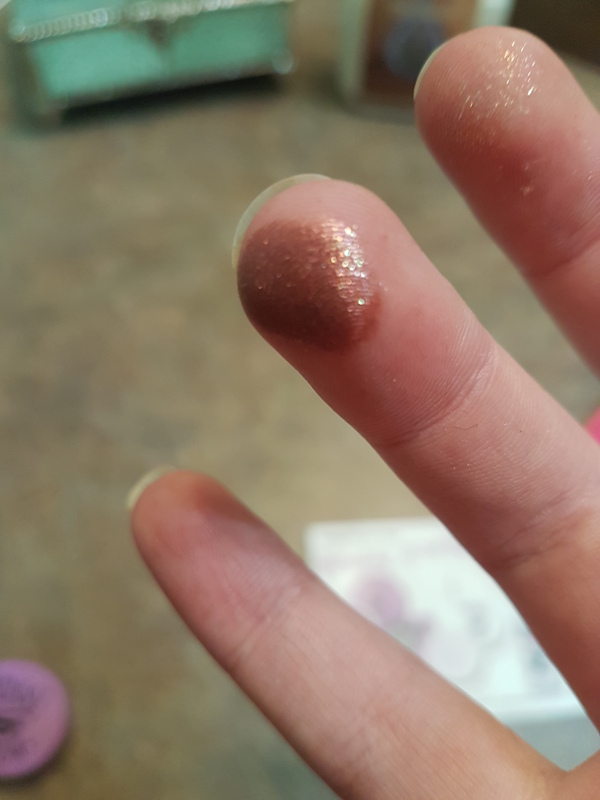 The top swatch has primer underneath and the bottom is on bare skin. This was the one I had the least excitement amount. I do not use blacks or dark greys often. Which is why I was not really feeling it to begin with. I must say this applies beautifully and it will be my go to instead of black. It is a dark grey but it still feels light enough and just the way it moves. 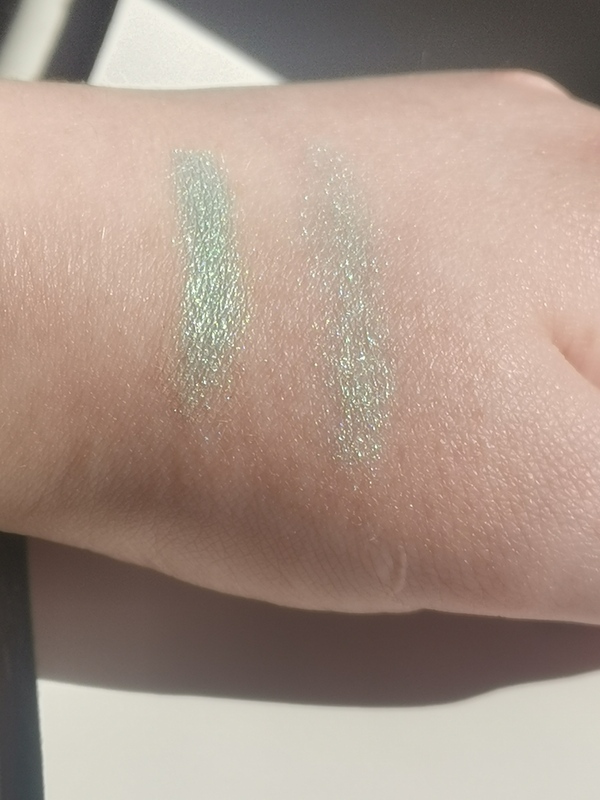 The top swatch is done over a primer and the bottom swatch is on bare skin. 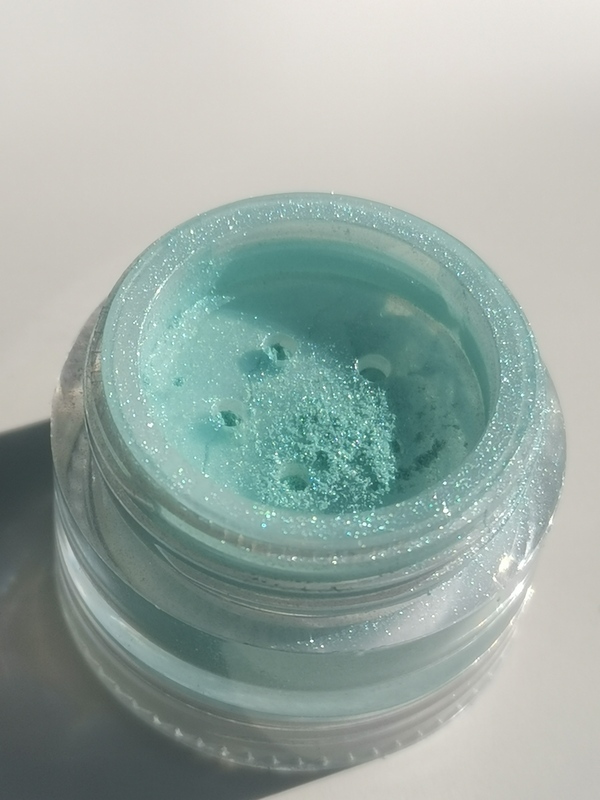 You can make out a difference with the eye dust but with this one the difference is night and day. 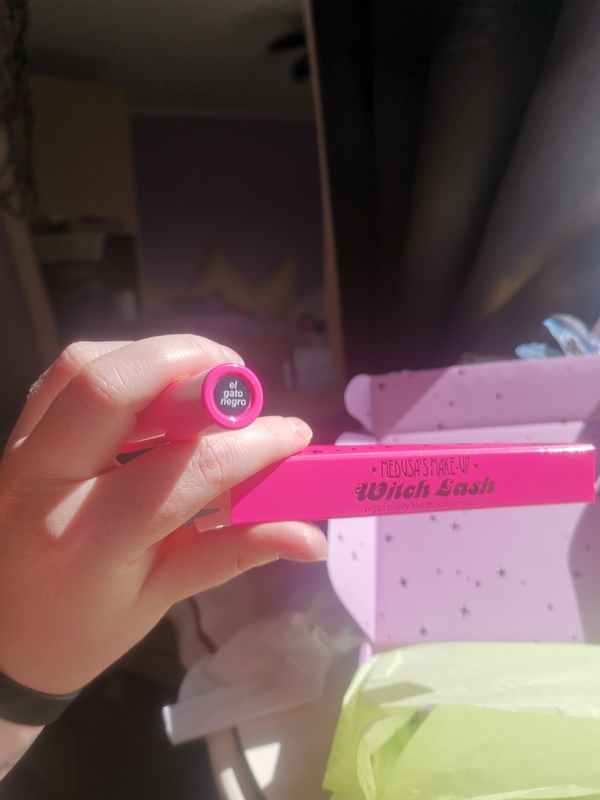 Clearly this was not included but I used Too Faced – Shadow Insurance eye primer. I also applied the swatches with a brush. I did this as I realized you do not get a realistic idea with finger swatches. I said I would give them three months and then decided where to go from there. March will be month three. Let’s see if they win me over for a while longer! As I start typing this Missy has fallen asleep on my lap. I do not quite want to move her and yet I have posts that need to be typed and posted. So I am going to find out how well I can do this from my phone (hopefully autocorrect does not decide to kick in). I have atleast one cleaning and organization post ready to go. Should have a second one right aways too. 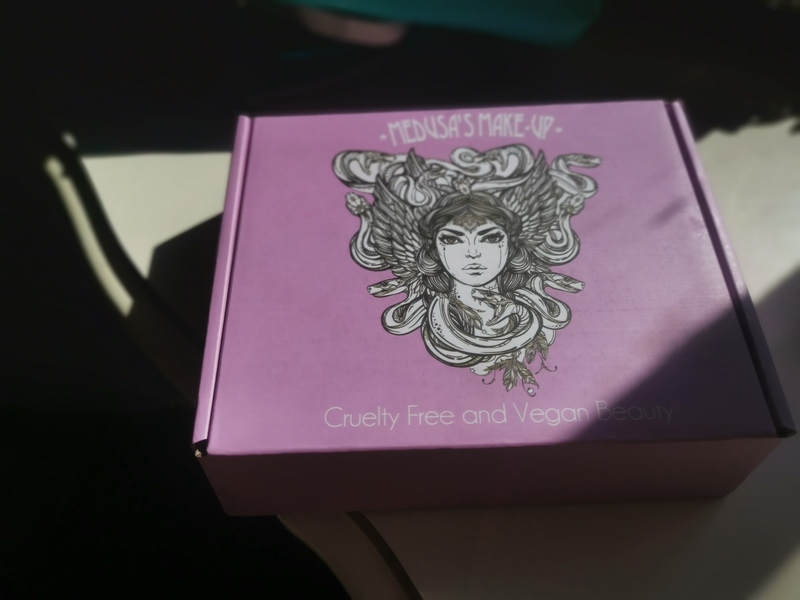 I also received another Medusa’s Makeup package to review. I have a thousand other ideas running through my head. Im going to go back and update some of the reviews also. I also have a million things going on whole taking care of this little girl here. Let’s get a move on with it now! I have been trying to get to this review for about a week now. 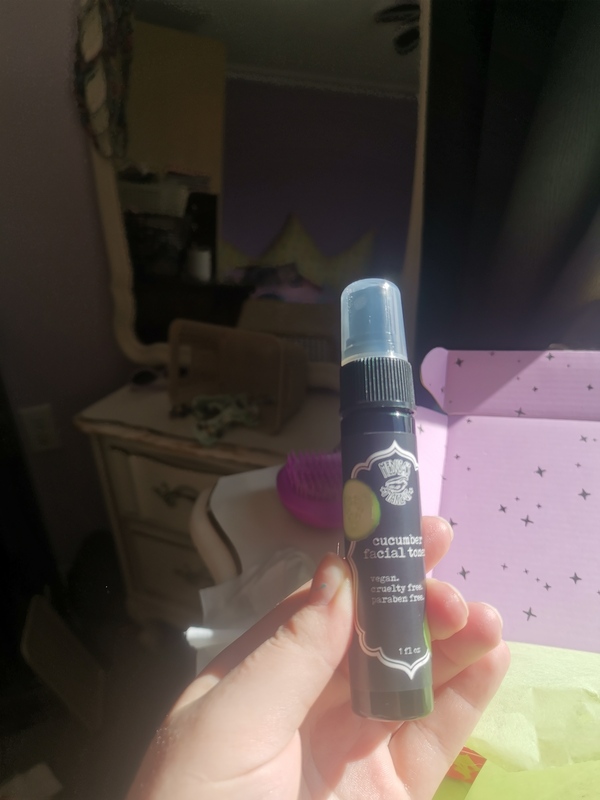 After trying out the lipstick from Medusa’s Make-Up I decided to check out their website again. I noticed that they do a monthly subscription. 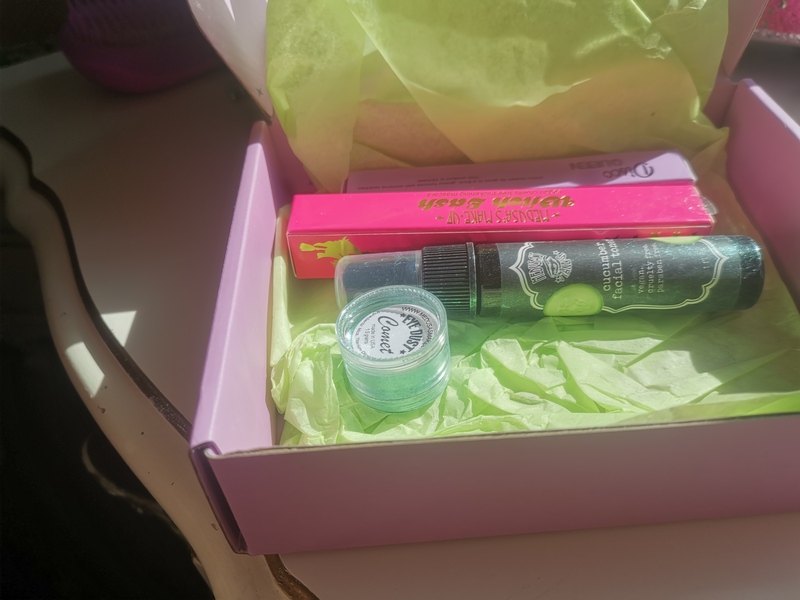 To me that is perfect since I did want to try other products. Plus if I got fun colours that would be easier than trying to commit to buying them individually. They offer both monthly and yearly. I always check the math on it and it worked out to be the same price. I also did not want to commit to a full 12 months because that may end up being overkill for myself. I paid $27.16 CAD ($20.95USD). This includes the shipping and a processing fee. Unfortunately it was not broken out on any of the receipts so I am not sure how much the box was itself. Shipping was $5.00 and rate increase to $10.00. I will keep it for another month but I may end it at that point. It seems fairly pricey to me for a regular subscription. 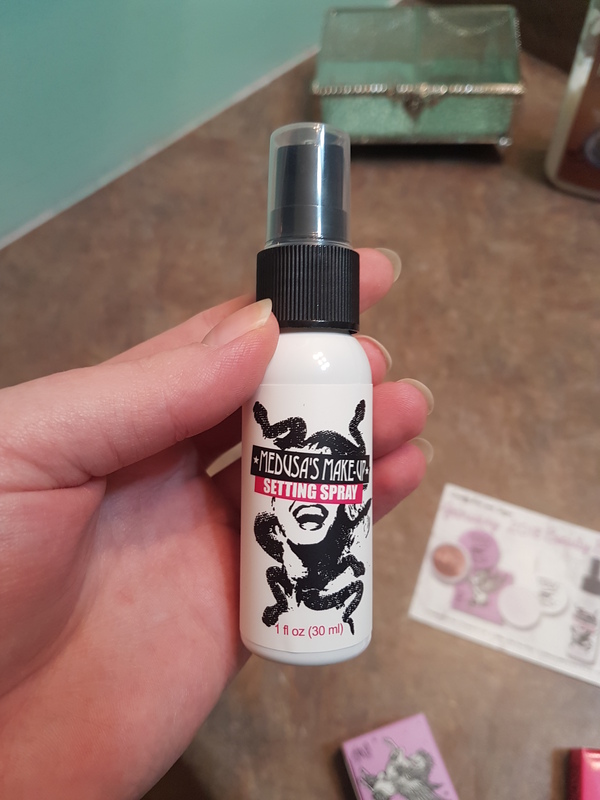 ** I have used this setting spray a few times. I do like it. I have only used it on light make up days. I am not sure how I would compare it to my others. I did swatch this but you can hardly see it in the picture. The glitter is gorgeous though! It is a gold irirdescence called Star Wars. The cost is $8.00USD. No idea how I am going to use this but I will find a way. Plus this pot will last a lifetime it looks like. Another neutral colour but it has some nice sheen to it. We have Mystical Eyedust in Chrysaor. Very happy with this colour and it is also safe for all other applications. Happy that I will be able to try this out on my lips as well. Having dual purposes makes me feel better. This costs $11.95USD. I will admit despite the raise in shipping I am looking forward to what will be received in February. 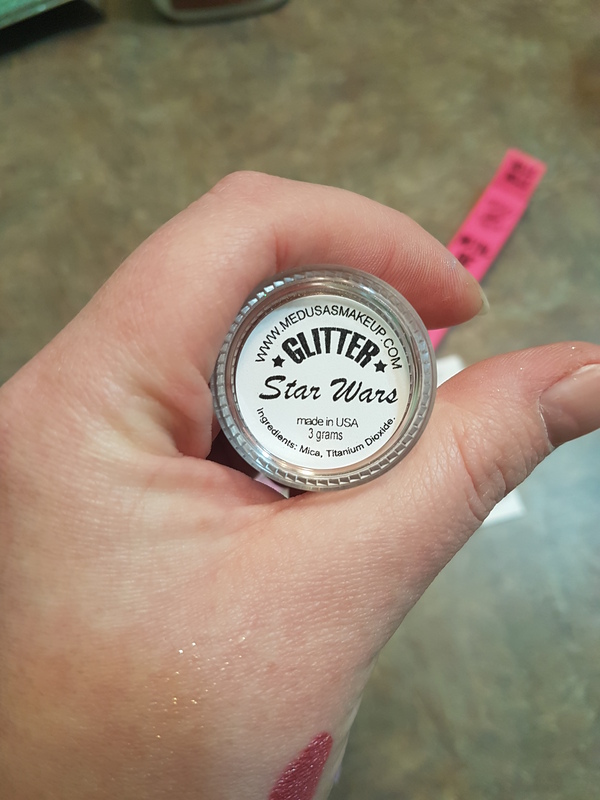 I probably would have never bought the glitter. I also would have stayed away from the metallic lip glosses. This is why I like subscriptions. Also before I forget. 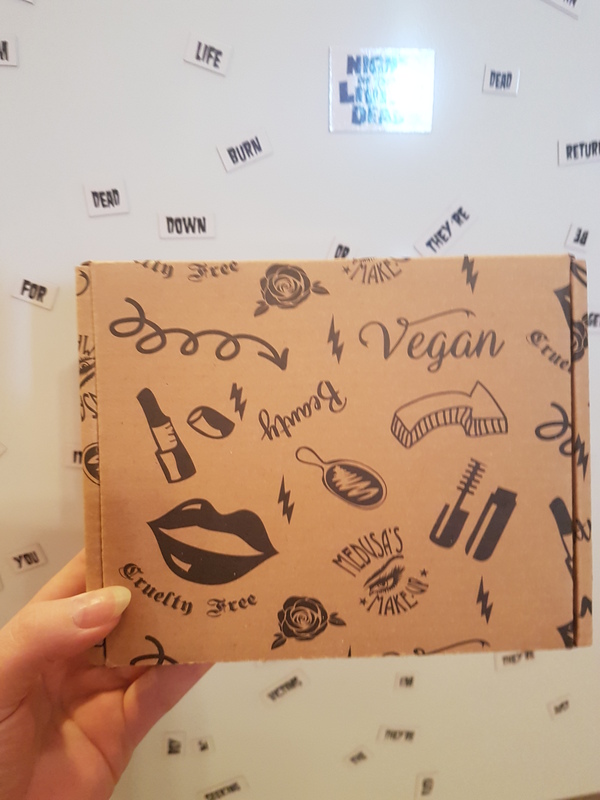 They are vegan and cruelty free. While I do not force myself to only buy items that fall under those terms I do look for them and favour those products/companies. I also want to note they are PETA certified and not Leaping Bunny certified unfortunately.